Breeders/Owners: Cynthia and Vincent Savioli. Breeders: C. Chase and M. Cellucci. Owner: Carrie A. Chase. Breeders: V. Sandage and D. Rodgers. Owner: Denise Hartley. Breeders: Mary Elizabeth Simpson and Cathy Santarsiero. Owner: Carol Black. 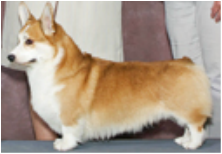 Breeder: Sandi Eaton. Owners: Paul Cope and Alene Sirott-Cope and Sandi Eaton. Breeder: Anne H. Bowes. Owners: Sally A. Miller and Anne H. Bowes. Breeder(s)/Owner(s): ___________. OR Breeder(s): __________. Owner(s): __________.